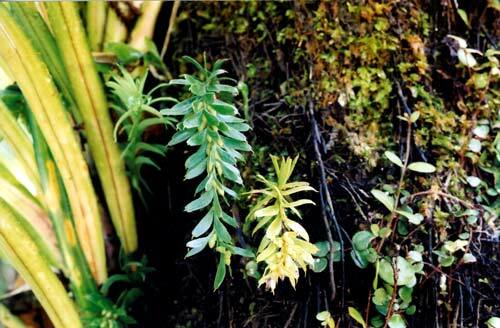 Tmesipteris tannensis is the most common of New Zealand’s four species of fork fern. Fork ferns usually grow as epiphytes, often on the trunks of tree ferns. Unlike most ferns, they lack roots, have leathery leaves, and produce pairs of spore-bearing capsules on the upper margin of their leaves.